Chimera, at its simplest, is a tool that defines camera positions and coordinates screen locations relative to those camera positions. 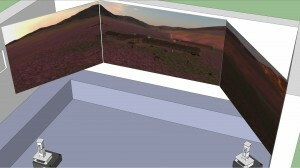 Its goal is to sit alongside one or more 3D applications and control their view according to a range of input options. It is built to be extensible. The majority of its functionality comes from extensions. Chimera is open source software developed by the Open Virtual Worlds group. It is used in a number of projects. Primarily it is used for museum installations. It is also used for the recording of videos and has been used for presentations and in demo situations. With Chimera users can define the size, location and orientation of a number of physical screens (or frames). Chimera can then take this information and use it to create view frustums which will create virtual views which match up with the frames. Chimera comes with a GUI so it is possible to make these adjustments on the fly. Using Chimera users can create multi screen, cave like environments on the fly. Chimera is designed to integrate into other applications. This can be done by directly referencing the libraries or by creating mechanisms for Chimera to coordinate with an external 3D application. Currently Chimera only features plugins for Second Life viewer based virtual worlds. Using an unmodified Second Life viewer Chimera can control the camera. This can be used to create pre recorded flythroughs which can be used for creating videos or for demonstrating live. Using a modified viewer Chimera’s functionality can be extended to allow multiple Second Life viewers to coordinate to create large scale CAVE environments. The plugin mechanism Chimera supports allows code to be written to control the camera position, as defined by Chimera. This control can take a number of forms. Chimera currently supports control via Keyboard and Mouse, XBox controller, Kinect and Flythroughs. Flythroughs are sequences of camera positions and orientations and timings. They define a route for the camera to take. Chimera supports full GUI editing of these flythroughs, as well as saving them to XML. Plugins can be more far reaching. Chimera supports a fully featured Overlay plugin. 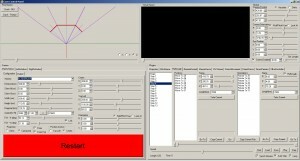 This allows the 3D applications that Chimera is controlling to be integrated into larger systems. Overlays support the addition of state to the system, as well as the ability to add menus and interaction over the top of the 3D application. Chimera is the core software which enables the Caen Township installation at the Timespan Museum and Arts Centre. Multi screen support, flythroughs, overlays and Kinect control are all used in this installation. Chimera’s GUI. Here showing the Flythrough plugin. 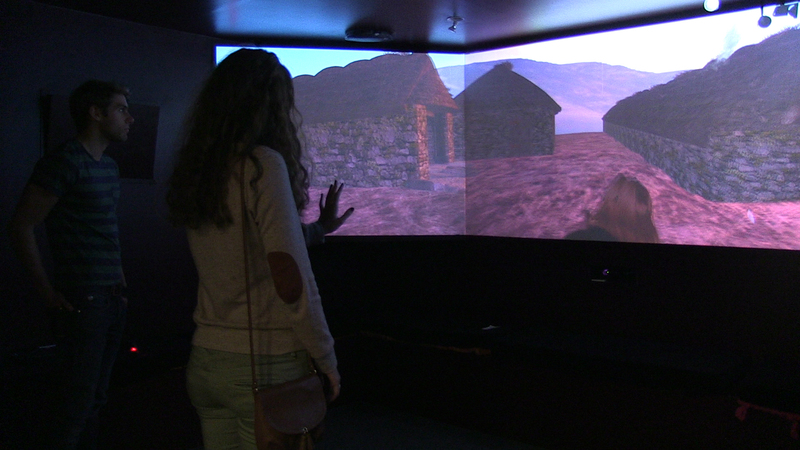 The layout of the screens in the Caen Towsnhip exhibit at Timespan. Inside the Caen Township exhibit at Timespan.